Nearly Wild Camping began in 2013 as a Community Interest Company that allows farmers and landowners with basic camping facilities to offer their land to campers. Since then it has taken off and its website and technology has been at the heart of its success, with major website improvements made in 2017. The Nearly Wild Camping website allows people to join on an annual subscription, which then gives them access to members-only website content, including a directory of all camp ‘sites’, with the ability to contact owners to make bookings. Everything from taking membership fees to allowing camp ‘sites’ to add their details is handled by the site, and controlled by Nearly Wild Camping’s administrators. We were originally invited to bid on the project in a competitive process with other web design companies in 2013. We used a mobile responsive WordPress design (for ease of use across all devices), and WooCommerce as the basis for the booking and membership systems. We used a business directory extension to run the camping directory, which will allow camping location owners to add themselves on payment of a fee. The site will also sell co-operative memberships, with members then able to book and pay for their stay at any location through the website. There’s an option to message the owner of the camping facility and a chance to rate and review where you’ve stayed. One of the key things about this site was to make it as simple as possible for camping location owners and members, but also the Nearly Wild Camping team as well. 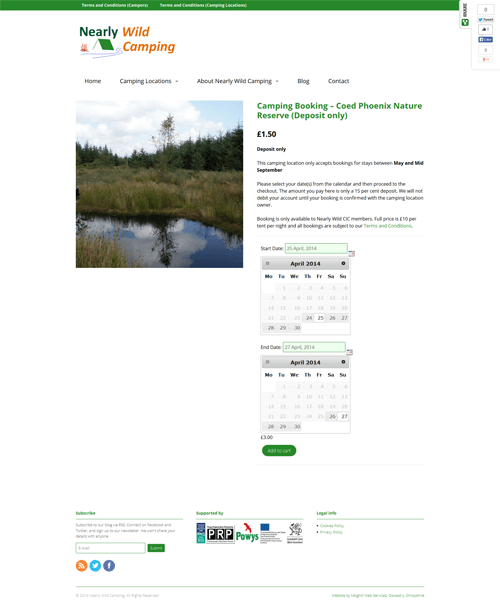 Nearly Wild Camping already had a hosted WordPress.com blog, so we integrated this with their MailChimp newsletter and social media profiles. The site went in its early form in 2014 and we handed it over and trained their team to manage it.